Donna Williams, 85, of Webster City, died Tuesday, July 31, 2018 at Southfield Wellness Community. Mass of Christian Burial will be held at 10:00 a.m. on Monday, August 6, 2018 at St. Mary’s Catholic Church in Williams with Father Rick Dagit officiating. Burial will be at St. Mary’s Catholic Cemetery, west of Williams. Visitation will be held from 3:00 p.m. to 5:00 p.m. on Sunday, August 5, 2018 at Foster Funeral and Cremation Center. 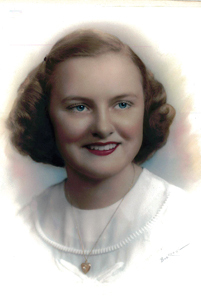 Donna Margaret Rykhus was born August 10, 1932 in Fort Dodge, the daughter of Oliver “George” and Helena Reisch Rykhus. She attended Parochial Schools in Fort Dodge. She reveived her degree from NW Institute of Medical Technology in Minnesota. She worked at the Lutheran Hospital in Minneapolis, MN as an X-Ray technician. She married Donald W. Williams on September 18, 1954 at Corpus Christi Catholic Church in Fort Dodge. The couple farmed northeast of Williams. In 2013, they moved to Webster City. Donna is survived by children, Kevin (Joyce) Williams of Webster City, Bruce (Leslie) Williams of Waukee, Julie Phelan of Bristow, VA, Janet (Todd) Staley of Webster City, Larry (Julie) Williams of Grand Haven, MI; 11 grandchildren; four great-grandchildren and many nieces and nephews. In addition to her parents, she was preceded in death by her husband, Donald in March of 2018; grandson, Blake Williams; siblings, Tom Rykhus, Ruth Rykhus and Beverly LaSourd. Donna was a member of St. Mary’s Catholic Church in Williams, St. Thomas Aquinas Catholic Church in Webster City, the Church Choir, Thursday Tea, NEH PTA, and the Woman’s Club. She taught Sunday School, quilted for community service projects and helped on the farm. In lieu of flowers, memorials may be left to Sister Servant in memory of Donna. Condolences may be expressed online at www.fosterfuneralandcremation.com.